Only minutes walk to the beach, in one of Te Awanga's oldest streets, Kuku Cottage has exceptional charm both inside and out. With its clean crisp interior and beautiful furnishings, it's the perfect get-away. 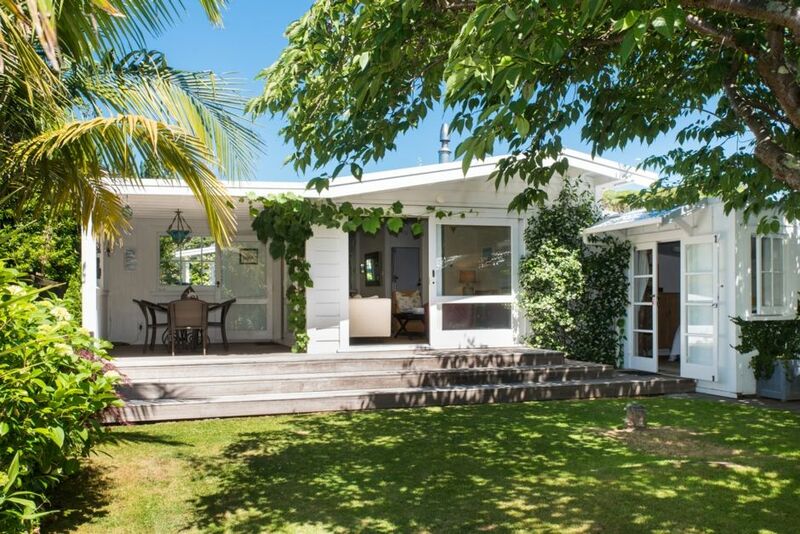 Only 1 km to the entrance of the renowned Cape Kidnappers Farm where you will find the acclaimed world class golf course, walking distance to Te Awanga Winery Estate and Clearview Winery. A little further down Clifton Road to the award winning Elephant Hill Winery. Or for a natural experience take a journey out to see the Gannets at the Cape. Just a short distance further is a Four Square Superette where you can buy all your supplies, including fresh bread and pastries, wine, lotto, and ATM and Post Shop. Beside this is a Fish and Chip and Chinese Takeaway shop. Just over 15 minutes drive to Havelock North, Hastings and Napier, from here you can explore all that Hawkes Bay has to offer. Multiple Golf Courses, Wineries, Retaurants and Bars. Enjoy the multitude of events such as concerts, Horse of the Year Show, Art Deco Weekend and weddings, or simply create your own event to enjoy a luxurious weekend in this home away from home. An entertainer's delight. 2 Beach Bicycles available for hire. You can tell from the moment you walk though the door that they take pride in the house and it's care. The house feels very homey and comfortable inside with books lining the wall in the main living space and beautifully decorated. The gardens and lawn are perfectly maintained. We felt right at home as soon as we arrived and really appreciated the fresh bread and jams! Our only regret is that we didn't stay longer. Kuku cottage is a gem. Very clean, comfortable beds and a well equipped kitchen. A wonderful base for exploring the Hawkes Bay Area. Three of us had our annual catch-up weekend in the Hawkes Bay and were fortunate enough to stay in Kuku Cottage. A fabulous, extremely well appointed cottage with everything you could possibly think of needing. I'd recommend this to anyone looking for a home away from home in the Hawkes Bay. Lovely property - very well equipped with everything and more than we needed. Great location - very relaxing.